Victoria Switzer and her husband, Jim, are building what they hoped would be their retirement home in the rural hamlet of Dimock, Pennsylvania, in the eastern U.S. When Cabot Oil & Gas offered a lease for the natural gas under their land a few years ago, saying that it might drill a single horizontal well nearby, they weren't worried. Switzer says they were told the drilling was an environmentally safe, low-impact process that would also help reduce U.S. dependence on imported fossil fuels. She and her husband didn't know much about the new natural gas boom that was just then arriving in northeastern Pennsylvania, seeking to tap gas in the Marcellus Shale rock formation roughly two kilometers underground. "In a short time, we realized that we were going to have 27 wells within a short walk from the house," Switzer said in an interview. "And as of today, we have 63, with indications that will double in the next two years." She said that the industrial nature of gas drilling, with heavy truck traffic and noise, and occasional wastewater and chemical spills, has transformed their peaceful country life. And now, she says, they are afraid to drink their water – or to let children and animals play in the creek. The Switzers are among a group of 15 families around Carter Road in Dimock who sued Cabot in November. They allege that the company's drilling polluted their water with chemicals, metals and methane, the main constituent of natural gas, causing explosions as well as gastrointestinal and neurological illness. "The smell and rotten taste, you couldn't take a shower in it because the smell stayed on your skin, you couldn't wash clothes in it," said Ron Carter, who lives with his wife, Jean, about 150 meters from a drilling operation. Patricia Farnelli said her five children were sick for months, until the family stopped using tap water for drinking or cooking. "They're fine all day at school, they come home, they get a drink of water, and that's when they got sick," she said. "They would have very, very severe stomach cramps, and double over, and throw up or have diarrhea." Monica Marta worried about her water when a relative showed her that her tap water could be ignited. "The flame from the jug of water was this high," she said, indicating about half a meter, "and that's what my kids and our family have been drinking." Several said they first realized something was seriously wrong when Norma Fiorentino's water well blew up on New Year's Day 2009, throwing cement slabs into the air. 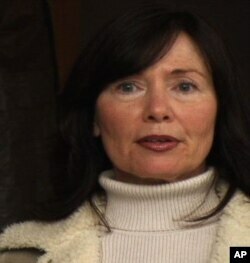 State investigators found Cabot's drilling had caused gas to migrate into her well. Fiorentino, a widow in her 60s, began buying water or getting it at a natural spring 10 kilometers away. Other families had similar scares. Sheila Ely was in her bathroom getting ready for church one morning last year. "The pipes started rattling, and it sounded like they were going to come through the wall," she said. She called emergency numbers at the Pennsylvania Department of Environment Protection. "DEP told us to get out of the house immediately. They said the house could explode." Ron and Jean Carter said their well was so full of gas at one point that they were warned to open windows before turning on a faucet. Like most of the other families who sued, they are now receiving drinking water deliveries from Cabot, as ordered by the state. Horizontal hydraulic fracturing, or hydro fracking, as it's also called, shoots thousands of cubic meters of fresh water, mixed with sand and a proprietary blend of more than 200 chemicals, deep underground, first vertically, and then horizontally. The fluid is injected at such high pressure that it cracks open pores in gas-containing shale, freeing small pockets of gas. Even some Dimock residents who didn't own land or sign leases have been affected by the drilling. Landowners also had little choice, since land ownership often doesn't cover the resources below. Ron Carter said he and his wife were reluctant to sign until Cabot representatives explained that not doing so would mean only that they would be paid a lesser royalty. "They told us that all of our neighbors had signed and if we didn't, they would go under our land and take the gas anyway," Carter said. Cabot Oil & Gas declined requests for interviews. But in a statement responding to the lawsuit, Cabot said it saw no merit in the claims. Industry representatives defend hydro fracking as safe, and contend that methane contamination is a coincidence, since it can also occur naturally. They say the drilling takes place too far underground to contaminate aquifers. The Dimock plaintiffs respond that there were no problems with their water until the drilling began. According to the DEP, four people have been killed and three injured by explosions caused by migrating gas in the last decade in Pennsylvania. Director Josh Fox has documented the environmental effects of new drilling methods, including flammable tap water, across 24 states in his new film "Gasland." He says reports of water contamination occur wherever there is hydro fracking, perhaps because the process uses such great pressure. "That pressure's got to go somewhere. It might be going back up the well bore," he said, "contaminating the aquifer in that way, since they drill down through the aquifers. Or it could be causing fractures in the earth that go all the way to the surface. It could be hitting natural fractures that already exist." Fox notes that toxic gases like benzene, toluene and hexane also accompany natural gas extraction. But water is the first priority for the Carter Road plaintiffs. Without drinking water, Victoria Switzer says, the house she hoped her grandchildren would visit won't be livable -- or saleable. "How would you advertise it?" she asks. "'Beautiful house in the country. Bring your own water.'" The Pennsylvania Department of Environmental Protection fined Cabot last year for chemical and fuel spills and wastewater discharges. It ordered the company to provide a permanent water solution for families whose wells are polluted. 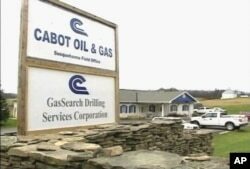 Cabot must also repair defective construction on its gas wells by the end of March or shut them down.